When October comes around I begin a horror season of titles that have made their way on to the awesome format that is Blu-ray. Some films have never looked so good and it’s a really compelling argument to revisit some of those classic horror movies you grew up watching only now they look better than ever. The film I’m taking a look at here is Phantasm from 1979, it’s written and directed by Don Coscarelli. 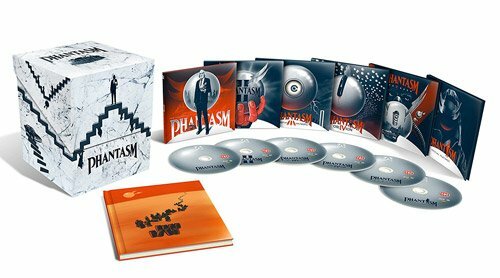 Arrow Video has recently released the Phantasm Blu-ray boxset in the UK which is what I am going to being reviewing starting of course with the first film. I’ll admit it’s been several years since I’ve seen the first film and can only vaguely remember it but I do remember really liking it. Let’s see if that still holds true and also whether Arrow Video have released the film with perfect picture quality. So without further ado here’s my Phantasm Blu-ray Review. Jody Pearson is a 24 year old musician, he finds himself called back to a small town in Oregon following the death of his parents to look after his 13 year old brother Mike. Mike witnesses some strange goings on after the funeral and decides to breaks into the mausoleum late at night. However he encounters something truly disturbing and terrifying, will his brother Jody believe him and what can they do about it? The story is written by Don Coscarelli. There is something about horror films made in the seventies and early eighties, a feeling maybe but to me it represents the best in terms of style and atmosphere. I’m thinking of films such The Omen, The Amityville Horror or Poltergeist. Phantasm has a certain something I struggle to put my finger on. Nevertheless it induces a creepy feeling with much of the film taking part in or around the Morningside cemetery, funeral parlour or mausoleum. Make no mistake Don Coscarelli does a great job of creating the perfect feel and setting for a horror film. The score is very good giving off that creepiness factor. The music features piano which is there to really take up the uneasiness along with the perfect beat. It all works well and certainly adds to the tension. The music is provided by Fred Myrow & Malcolm Seagrave. The acting pretty good to be fair and the cast is pretty small focusing mainly on the two brothers and friend Reggie, oh and of course the creepy Tall Man played by Angus Scrimm. Watching Phantasm now I still feel it has a unique place in the genre by merging horror and sci-fi with a perfect blend of comedy. Add to that an incredibly surreal atmosphere and you have something very special. The Tall Man physicality is an image that will stay with you forever and is why the films have remained so popular. I really enjoyed experiencing the film all over again having not watched it for many years, needless to say I will be watching this one fairly often from now on. The news is good I have no complaints with this release, the picture quality is simply perfect. The image is sharp and clear with the colours vibrant, furthermore there no signs of any speckles or dirt marks. On to the extras and Arrow Video deliver an excellent set with Reflections of Fear: Phantasm the highlight featuring writer and director Don Coscarelli with all the background stories from the making of the film. Phantasm (1979) is available now on Blu-ray. An original horror concept that merges sci-fi and horror and creates on surreal horror masterpiece.